I have 2 wishlists today the first being a fun and flirty Day Date outfit and the second being a gorgeous, glam Date Night outfit. We all love a good date - weather it's a first date, a date with your partner you've been with for years or even just a fun day/evening with a good friend - it's always a good excuse to get dressed up, feel great about yourself and look your best! First up - The Day Date. This could be anything from lunch to a seaside walk to a round of mini golf - this outfit is such a cute, simple look! I am loving pink at the moment. Pastels, brights, neons - I think they are so cute and you don't need alot of it to make an outfit. I choose these jeans as the statement piece of this day date outfit because 1. the colour is fab and 2. because jeans are fab for a nice afternoon out. Easy to wear and they look great! I love love love the little lace shirt so much it is totally on trend still and it is just a fraction of the price you would pay in other high street stores! The satchel and shoes are so sweet for the Spring and Summer months, the bag is the perfect size for a day out! And now it's time for the look I'm loving for a Date Night. Drinks at a bar, dinner in a pub or even a trip to the cinema - this is such an easy and sophisticated look to pull off! First up I am loving these black leather look leggings - I'm not normally one for leggings with a shorter top but because of the material I think these can work! The top is a cute monochrome pattern - I think black and white is great for nights out (especially on a date) it's hard to go wrong with it. I had to add a bit of colour (obviously) and that is where the shoes came in. I am obsessed with pointed heels at the moment - 10 years ago when I first started high school they were all the rage and now they are back and bigger then ever! These are a subtle pop of pink which match the gorgeous lipstick ('small talk') I've added! Earrings for a bit of bling and a little bag for all the essentials - done. Everything chosen is from the fab George at Asda - I love how on trend George always are and the fact it is so affordable makes it a thousand times better! These outfits could easily be mixed up aswell - swap the tops and there's another 2 fab looks! What do you girls think?! These work great for dates or better still for a girly lunch or a night out with your besties aswell! They both look lovely outfits. Those ballet shoes are gorgeous! I love both outfits! I cant believe how cheap they are! 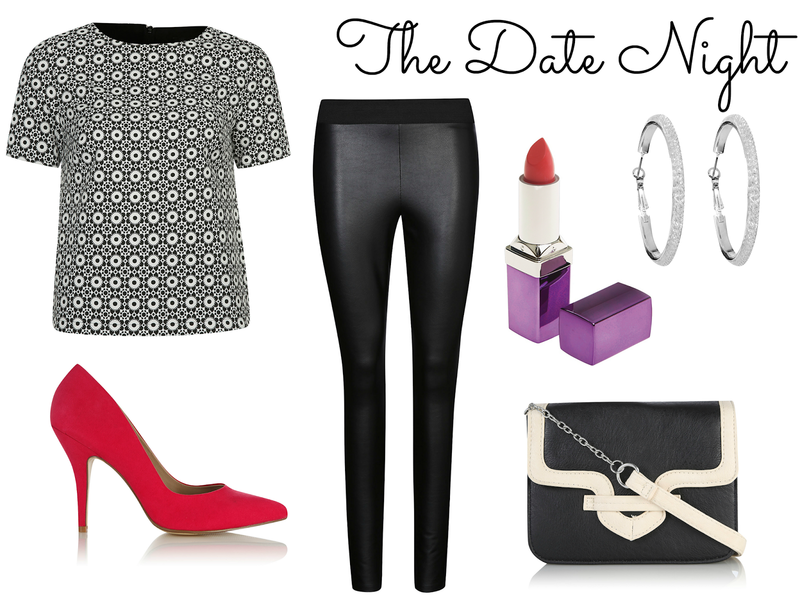 I love the Night Date Outfit, it reminds me of the Sandy from Grease look.